We highly recommend this great tutorial by Tomáš (Timon). 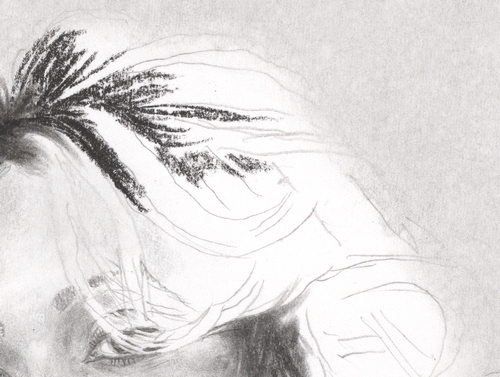 Drawing hair is definitely one of the trickiest part of almost every portrait. 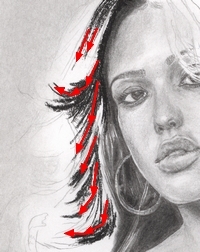 In this tutorial, Tomáš introduces some easy and effective ways to draw wavy or straight hair or hair blowing in the wind. A huge thank you to Tomáš for this very interesting lesson. Drawing hair is definitely one of the trickiest part of almost every portrait. However, you will definitely like it if you acquire technique and skill in it. 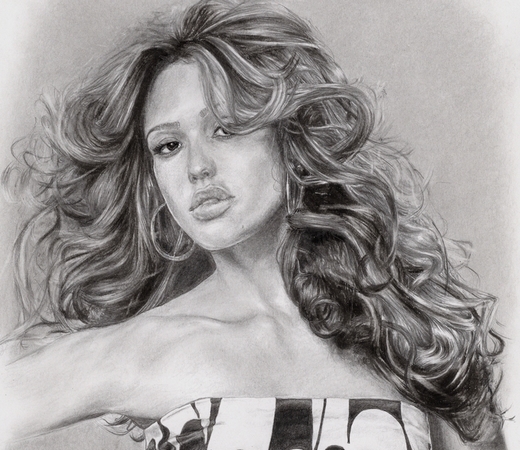 Therefore I introduce some easy and effective ways to draw wavy or straight hair or hair blowing in the wind. No matter how much chaotic the hair is, you'll be able to draw it. This tutorial explains two techniques of drawing hair on four portraits. I laid emphasis on minimum of drawing equipment. You need just pencil, charcoal and rubber eraser. I admit that better equipment makes better drawing, but maybe you find inspiration or some new ideas in this tutorial. 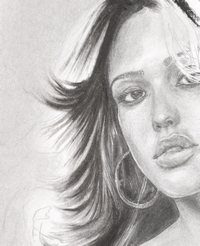 The first time I ever tried to draw realistic wavy hair was when drawing my portrait of Hilary Duff. As you can see, the hair may look real when you distance the portrait from you. Actually, if you come closer, you’ll see it consists of curved lines drawn with charcoal and smudged with a rubber eraser. When you are done take a new piece of an eraser (a clean one) and by erasing lines from the black area, you create as many strands of hair as you need. Let‘s go on with more realistic look of hair. I’ll explain the matter on some of my latest portraits. For example, let‘s take Alessandra's and Jessica’s hair. I used an identical technique for both. It consists in a little bit different way than the one I explained earlier. I think it’s more elegant and the result looks better. Of course, you can combine these two. Ok, let’s describe how it works. In case you have a pencil eraser or other special erasers, use them. However, I do not. Therefore I've figured out this easy way to substitute a hairline eraser. Moreover, you can use one piece of a rubber eraser for rubbing charcoal in. Note that for rubbing charcoal in you need the surface of the rubber to be smooth. It should rub in, not out! On the contrary, for making light lines in hair you need a clean rubber eraser to rub charcoal out. A good sketch usually precedes every portrait. However we're dealing with hair. There is no need to draw an accurate skatch of hair. If you draw main lines as contour and forelocks, it's quite all right. Make several lines with charcoal in places where hair appears to be darker. It can be caused by casted shadow or shading. I remark they should be lines. And the more narrow the lines are the better. If you see that there is a whole black area in the reference picture, fill it with charcoal in your picture and then rub it in with the 'smudging' rubber, which will also help you to cover narrow areas clumsily reachable with charcoal. When you're done with some of the lines drawn with charcoal (you don't have to make them all at one go), you can rub them up to make them look more smooth - like hair. In the picture you can see the directions of rubbing. You can continue with the step number one in the same manner. I used the same technique by drawing hair in other portraits. 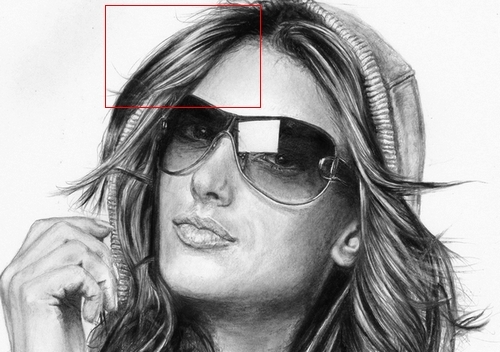 For instance, Alessandra Ambrosio - I liked her hair in the reference photo and its look really matched this technique. Here you can see the reference photo. This is the drawing. Let's zoom in on one forelock. Again, red arrows mean directions of rubbing the charcoal lines. 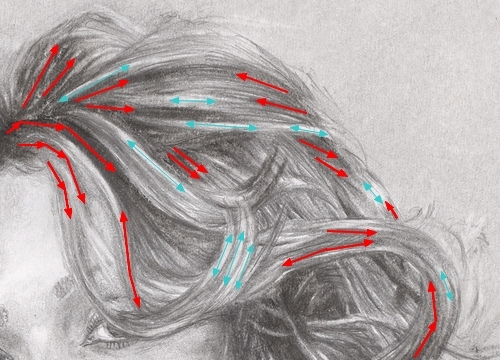 Now you should be familiar with two possible ways of drawing hair. The two of many. I'd be glad if it helped you even a little. The first technique: Draw the whole area of hair with charcoal, smooth it out and make forelocks (rub it in paper with 'smudging' rubber), then rub out lines representing lighter forelocks. The second technique: Draw just lines with charcoal and then rub them up. As I mentioned above, you can combine these two techniques. Both are suited to most of kinds of dark hair. 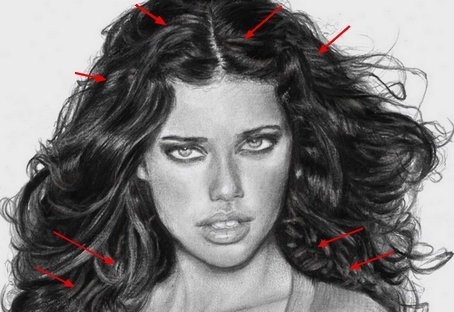 Anyway, if you draw extensive dark wavy hair, I recommend to combine both the techniques as you can see in the following drawing of Adriana Lima. Red arrows point the areas where the first technique is used, the rest is drawn according to the second method. Drawing. 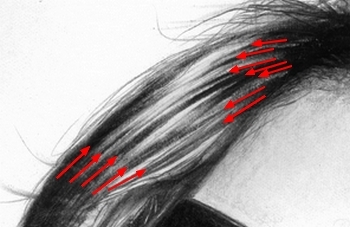 Note that the blowing wider strands of hair are drawn with charcoal and 'rubbing' eraser, but the thin strands are drawn with pencil (2B or 4B) and the thinnest strands are drawn with pencil F (you may use H as well). Thank you for reading this tutorial. I'd be really pleased if this tutorial helped you somehow, inspired or just enjoyed you. If it did, you might show me your results or let me know your opinion and contact me, it'd be welcome. Or you may share your opinion or questions relating to this tutorial and post it here on my blog. I'll try to answer all your questions. Thank you Linda, it's great appretiation for me! Good luck with your portrait! Wow this ut is great.do you have anymore tutorials? Thank you, Tomáš! I'm working on a portrait of Miley Cyrus and got everything done except the hair. I came to a screeching halt. Your techniques sound like just what I was looking for and I appreciate that you explained it well. Your example portraits are gorgeous! If I can do it half as good as you did, I will be very happy. Thanks! Hi! Thanks for the tutorial. It is indeed very helpful. 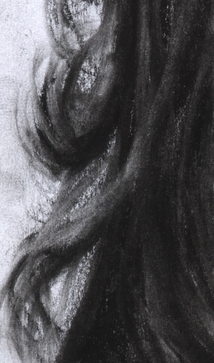 I have a small question: Which charcoal do you recommend for drawing hair? Hi, I have used leads and several kinds of charcoal from Koh-I-Noor Hardtmuth named 'Natural drawing charcoals'. They are suitable for this technique as well, but to achieve better results, I prefer soft ones which leave really black and bold trace. As for me, the best one for hair is a black pastel chalk from a KOH-I-NOOR TOISON D'OR package (these are actually not charcoals ). I have a package of six colours, so I use the black. Really .. it's verry usefull tutorial and i like it.. thank you very much. it is important to use mechanical pencil(HB) rather than HB woodcased pencil,can I use a faber castell PITT charcoal and what type of charcoal a soft,medium or hard?